Apple has just launched its iCloud.com online service which will later be the successor to MobileMe. Those signed up to the service can now use their web browser to access their Mail, Contacts, Calendar and more. You may recognize the login screen from the image that was leaked before WWDC back in June. Once you’re logged in you have access to your iCloud Mail, Contacts, Calendar, Find My iPhone and even your iWork documents. If you’re already a MobileMe users, the interface will feel very familiar, though there are a number of updates to its appearance. 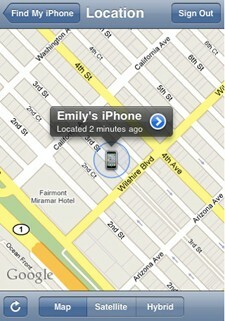 One of the more interesting news yesterday was the fact that Apple made “Find my iPhone” free for everyone to use. Therefore we have decided to create this How To… Guide, which will hopefully make it easier for you to set up the App. This works on the iPhone 4 iPad and iPod touch, however for it to work you must update to iOS 4.2.1, once you have made sure you are up to date, follow the steps below. 3. Now enter your Apple-ID as well as your password, these are the same as the ones you use for the App Store. If you don’t have an Apple-ID, there is the option to create one right there in the section. 4. Your device will now try to verify your account, if this is your first log in with this ID, then Apple will send you a verification mail. When this has been completed your iPhone, iPad or iPod Touch Will be ready for detection, to test it simply log into me.com or through the “Find my iPhone” app from the App Store. You can try the different options, locate on map, send a message or play a sound, however be careful not to wipe your phone completely. Apple makes Find My iPhone/iPad service free! Among todays great news is the fact that Apple has decided to make Find My Iphone (iOS device) a completely free service. Find My iPhone / iPad is now free for iPhone 4, the iPad, and the fourth-gen iPod touch running iOS 4.2.1. Just like with the paid version, you’ll be able to locate your device on a map, lock it, display a message, play a sound, or remotely wipe your data from any browser or the updated iOS app, which should presumably go live sometime today. While we still think it would be amazing if Apple would make MobileMe a free service for all, we are still happy with this update. If you’re not familiar, the service basically does two things: it helps you locate a lost iOS device or lock down your data if your device is stolen. You still turn it on in MobileMe preferences, but now it just doesn’t cost you anything. In the event you lose your iOS device, you can use one of your other iOS devices or the MobileMe web site to track it or lock it down. Today is the day that we have all been waiting for! Finally. 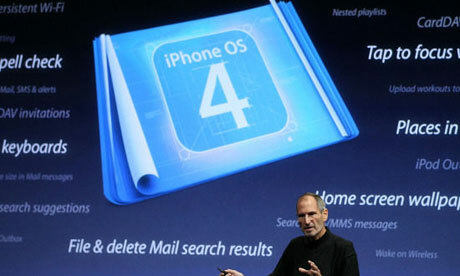 Apple is shipping iOS 4.2 to iPads, the iPhone 3G, 3GS and 4, and second, third and fourth generation iPod touches. Those of us that have an iPad gain the most, since we will be getting app folder enhancements and multitasking for the first time. The update also includes Game Center, AirPlay and AirPrint for all devices. 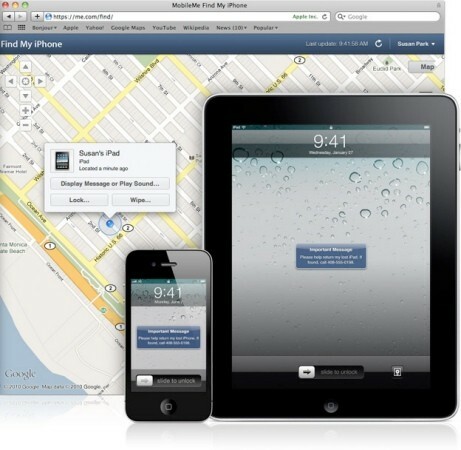 Furthermore Apple has announced that Find My iPhone, iPad, or iPod touch is now free to use without a MobileMe subscription. The update should be available for downloading around 10:00 AM PST today. You’ll need the latest copy of iTunes (version 10.1) so make sure your Mac is up-to-date. Afterwards tether your iOS device to your Mac and check for updates in iTunes after the appointed time. Check out Apple’s press release for complete details on this exciting new iOS release. For those who prefer the direct downloads, here are the links! 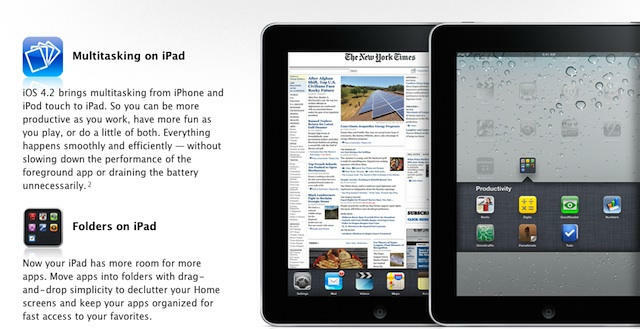 Direct download for iPad here. Direct download for iPhone 4 here. Apple to release firmware which will fix reception issues. As previously reported by many new iPhone owners, the signal strength of the iPhone seems to be dependent on the placement of users’ hands. Now however as more users who don’t even own the iPhone 4 are reporting similar problems when having upgraded to iOS 4, people are starting to speculate that there is also a software issue involved in the matter. According to sources the updated firmware iOS 4.0.1 is expected to address a issue in iOS 4 related to radio frequency calibration of the baseband. As you might remember iOS 4 introduced some enhancements to how the baseband selects which frequencies to use, so it makes sense that the error may have crept into those changes. This is also an indication that this is a software issue and not hardware related. The firmware is expected to be released during the next week, with speculations that it could be as early as Monday. We will of course keep you updated as we receive more information. Apple sells 1.5 Million iPhones during the first day! A while ago we reported that Apple sold 600,000 pre-order iPhones, however now rumors are stating the actual number of sold iPhones during the first 24 hours could be as high as 1.5 million. According to Oppenheimer analyst Yair Reiner you can calculate roughly how many iPhones Apple actually might have sold in the first day. Apple said it received 600,000 U.S. pre-orders. 100,000 iPhone 4s were at Apple Stores that hadn’t been reserved. Best Buy had 50,000 units. Multiply that amount by two to arrivate at international sales. The survey also helped define who Apple’s real competitor is. Despite Research in Motion being the No. 2 smartphone company present on the market, if you ask most iPhone buyers they will tell you that the real competitors are the up-and-coming Android-based handsets from Google. Rules to keep your email organized everywhere. Support for external email addresses. As we mentioned in an earlier post Apple also released a Find My iPhone app that now provides you with quick and easy access to the Find My iPhone service from all devices running iOS. While the App sounds brilliant, it does depend on you having a 2nd device to find the first one. The App can be downloaded from the App Store, is free, even though you will need a MobileMe account, which costs $99 yearly.